My special friend and I – she knows who she is – recently took a trip to Niagara Falls and Toronto. I had never been to either, and although she had been there, it had been a long, long time ago. It was interesting fare. In Niagara Falls, I didn’t realize that there has been a city built up around the Falls on both sides, but especially on the Canadian side. For some reason, I thought it was more wilderness. Maybe a little more like the Grand Canyon. And yes, the Falls are better viewed from the Canadian side. 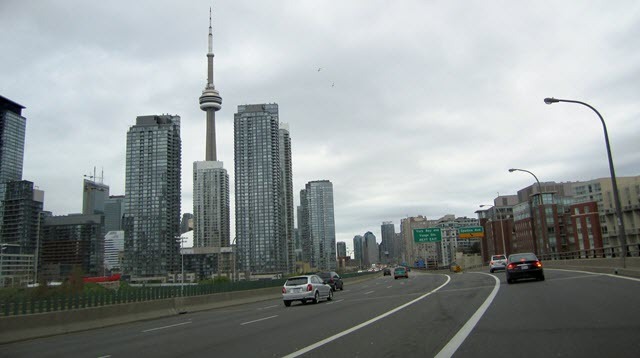 Toronto is, according to Wikipedia, the fourth most populous city in North America, after New York, Mexico City and Los Angeles. I was a little surprised by that. It felt big but not overwhelming. And public transit seemed to be okay but not great. Second, we went up and down Yonge Street, one of the main arteries, looking for a decent restaurant. Couldn’t really find one. It was chock full of Starbucks and Chipotles and Japanese noodle houses, but somehow I thought it would have been easier to find a half-decent restaurant than it actually was. Toronto is a very racially diverse city, and you could see that in the faces on the street. There were a lot more Asians there than I expected. And we weren’t anywhere close to Chinatown. We were apparently pretty much in the gay section of the city. Which, right at Halloween, was pretty impressive, if you know what I mean. As one would expect, there are a lot of parks in the city – although nothing to match Central Park or even the Parc du Mont-Royal district of Montreal – but it was nice. A lot of old churches, the kind with the tin or copper roofs that turn green over time. Canadians really are very polite. A number of them apologized to us, for nothing really. It was clearly that we weren’t in Boston anymore, where social niceties can be, shall we say sparse? This entry was posted in Culture and tagged Canadians, Niagara, Toronto. Bookmark the permalink.